Today, more than one-fourth of all workers in advanced nations are knowledge workers. Knowledge workers create the innovations and devise the strategies that keep their firms competitive. Yet companies continue to manage this new breed of employee with techniques designed for the Industrial Age. As this critical sector of the workforce continues to grow in size and importance, that’s a mistake that could cost companies their future. 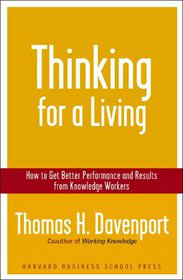 To fill this vacuum of knowledge about knowledge workers, Thomas H. Davenport, author of the best-selling Working Knowledge, has written Thinking for a Living. Davenport holds the President's Chair in Information Technology and Management at Babson College and is an Accenture Fellow. He has written, co-authored, or edited 10 other books and more than 100 articles for such publications as Harvard Business Review, the Financial Times, and Sloan Management Review. Thinking for a Living is the result of 15 years of research on business processes and how they can be improved, including analyses of more than 100 companies and more than 600 individual knowledge workers. In this summary, we’ll explore what a knowledge worker is, the four major categories of knowledge workers, and how such workers differ from traditional employees. Then we’ll outline the metrics, processes, and technologies that can enhance their productivity. We’ll also discuss how to develop knowledge workers’ capabilities, invest in knowledge networks, and create the conditions that will motivate them to excel. Lastly, we’ll explain how to change the managerial mindset to match today's knowledge worker environment.